This is a tool for writers, particularly writers of fiction. “Writing is structure,” William Goldman said, but too often aspiring writers plunge into their work without grasping this fundamental principle. Story structure is one of the most important concepts for a writer to understand—and ironically, one of the least frequently taught. 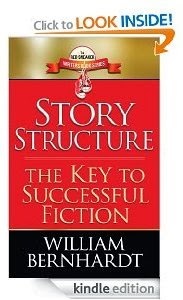 In this book, New York Times-bestselling author William Bernhardt explains the elements that make stories work, using examples spanning from Gilgamesh to The Hunger Games. In each chapter, he introduces essential concepts in a direct and easily comprehended manner. Most importantly, Bernhardt demonstrates how you can apply these ideas to improve your own writing. The Red Sneaker Writing Center is dedicated to helping writers achieve their literary goals. What is a red sneaker writer? A committed writer seeking useful instruction and guidance rather than obfuscation and attitude. Red sneakers get the job done, and so do red sneaker writers, by paying close attention to their art and craft, committing to hard work, and never quitting. Are you a red sneaker writer? If so, this book is for you.